Hitman 2's Agent 47 takes on the Holiday Hoarders event clad in his holiday best to take on fun Home Alone-themed targets. Hitman 2 is getting into the holiday spirit with the Hitman 2 Holiday Hoarders event, live in-game for a limited time now. 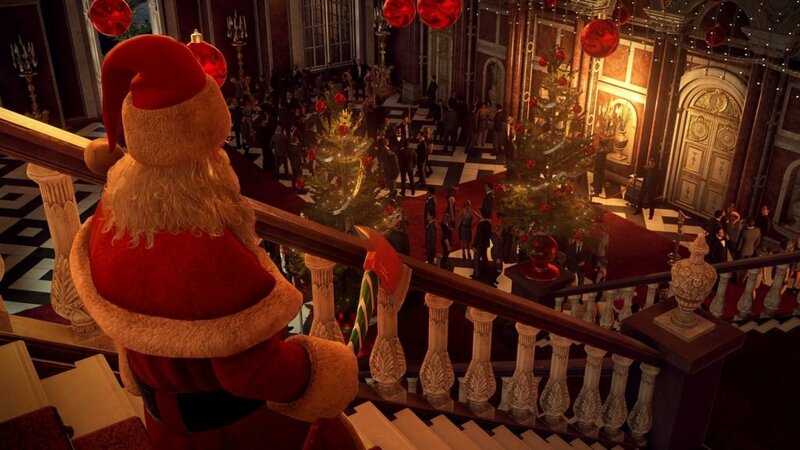 From December 18 through January 8, Hitman 2 players can jump into the Paris Legacy location for free to get into the Santa-centric mood. The Holiday Hoarders event adds a festive look to the Paris Legacy map with snow cannons, presents you can unwrap, and holiday decorations to get Agent 47 looking and feeling like he's ready for Christmas – or at least to look the part. While on the map, it's your job to eliminate two thieves who have entered the Sanguine Fashion Show and need to be taken out before they steal any other items. There's also a selection of new items, including Explosive Snowballs and Holiday Shuriken to help you get the job done. The Secret Santa Challenge Pack has a fun bonus, too, and will give you the Santa 47 suit as a permanent inventory choice, but you have to make sure you complete all the event challenges before it will unlock. Then you can walk around "ho ho hoing" to your heart's content (and offing them, too). The Hitman 2 Holiday Hoarders event is seasonal only and will be in Hitman 2 for a limited time, so make sure you get on it if you're interested in seeing Agent 47 in a Christmasy mood. The mission will be removed from the game on January 8, but if you've unlocked the Santa suit by then, you'll get to keep it forever. If you own Hitman 2, you can play Holiday Hoarders immediately after you download the December Update. If you're new to the game and just got it, look for the "Hitman 2 - Holiday Hoarders" download in the store to download to your console and get started. This is the exact same mission they did with Hitman 1? All this is already included with Hitman 1 I'm pretty sure.